The International Journal of Reproductive Medicine (formerly Iranian Journal of Reproductive Medicine) is published by the Research and Clinical Center for Infertility, Shahid Sadoughi University of Medical Sciences of Yazd. Yazd Research & clinical centre for Infertility was established as the first IVF centre in Iran in Oct 1988. The center was designed to provide the necessary services for expanding knowledge and treating infertile patients who have to travel into the European country. A specialist team had been trained in Germany and then Belgium to find high quality skill in evaluation and treatment of infertility with both laboratory and clinical background. 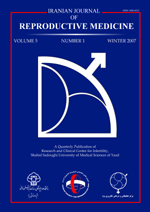 The International Journal of Reproductive Medicine is published on a quarterly basis.